Friday Night Fight Results Los Angeles | MMA Fighting Events Videos Techniques UFC Fight Picks and News. Los Angeles MMA (Mixed Martial Arts) fans warmed up for UFC 145 with an MMA event put on by Spar Star Promotions. 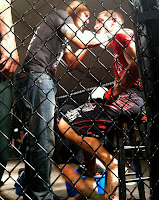 Tony Padilla and his Spar Star Promotions crew set up some great MMA fights at the Hollywood Park Casino Friday evening. Thirteen fights on the card and several finishes highlighted this MMA Event, and satisfied the fans that poured in to witness the action. Here are the complete fight results for Friday Night Fights at the Hollywood Park Casino put on by Spar Star Promotions. 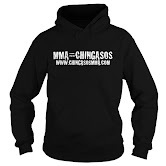 A special thanks to Chingasos MMA contributor Ricardo Robles for helping with the results write up. **Stay tuned for photos from this event. Nielson landed some good right hands in the first round which kept Mason from opening up his attack. Mason changed the momentum by landing a solid kick to start the second round. Nielson was able to elude Mason for most of the round after that kick. Nielson landed a solid right hand to start the third round which forced Mason to attempt a shot. Nielson was able to fight it off but eventually the fight went to the ground and Mason was able to take the top position to finish the round. Results: Kurtiss Nielson wins via split decision. To start the fight, McCarty came out swinging, and Do threw his own chingasos. McCarty got the better of the exchange, connected with a solid chingaso, and finished the fight with a KO in only 24 seconds. Lopez scored first by finishing a single leg takedown. After scrambling on the ground for a while, Lopez regained top position but Kimbrough was able to lock up a triangle choke. Lopez defended as the round ended. Lopez again was able to score a takedown. He eventually took the back of Kimbrough, but Kimbrough was able to work his way out. Kimbrough then worked his ground game and took Lopez's back. From there Kimbrough finished Lopez off with a rear naked choke. Results: Jonell Kimbrough wins via rear naked choke submission. Christian came out strong and got a quick takedown. Guy got back up but Christian got another takedown and went to mount. Guy got back up and both fighters threw chingasos. Christian landed some hard shots, and the referee stepped in to stop the fight with only seconds to go in the first round. Gomez starts out aggressively but fails on a takedown attempt and Olson takes advantage. Olson takes mount and then begins to rain down punches in bunches forcing a ref stoppage. In round one, after a clinch and scramble, Bondole ended on top. Bondole went for some ground and pound and followed up with a top mount guillotine attempt. Round two, Spencer went for a takedown. Bondole went for a guillotine and then worked his way back up. Bondole got a takedown to end the round. In the third, the two fighters clinch again, and Bondole ends up on top. Bondole kept top position, throwing punches from the guard for the rest of the round. The first round went back and forth with both fighters standing in the pocket and firing off shots. A takedown that Gonzalez scored probably won him the round. Gonzales scored a takedown early in the second. Camerana made his way up and then locked up Gonzales in a guillotine attempt. Gonzalez escaped and they fought in the clinch for the remainder of the round. Round three was more standing in the pocket and firing off chingasos. Gonzalez landed some solid shots but couldn't put Camarena away. Results: Diego Gonzalez wins via split decision. Cassano landed hard chingasos to start the fight, but then accidentally kneed Foster in the groin. After a few recovery minutes, the fight resumes and the fighters clinch and exchange knees. Cassano attempted a kimura from the standing position, but eventually Foster ended up on top and finished the round with ground and pound. In round two, Foster connected with a solid upper cut and followed with a takedown. Foster went for guillotine then continued with hard knees. Cassano ended the round with a flurry of chingasos. Both fighters came out and exchanged to start the third round. Foster ended the round with a takedown. Results: Foster wins via unanimous decision. Gonzalez lands a kick to the side of the head of Fernandez to start the action. Fernandez unfazed shoots in and scores a takedown. The ref stand the fight up after it stalls and Fernandez scores another takedown. Gonzales showcases nice Muay Thai leg kicks to open the round but eventually leaves himself open and Fernandez shoots in and scores a takedown. Fernandez doesn't do much with the takedown and the ref stands it up. Gonzalez attempts a guillotine but Fernandez defends. Both fighters shoot in but Fernandez gets the worse of a ram like crash were their heads collide. Fernandez folds backward and Gonzalez goes in for the finish landing punches squarely on Fernandez's chin forcing a ref stoppage. Results: ****The fighters heads colliding was deemed an illegal blow and the fight was sent to a judges decision. Fabian Gonzalez wins via judges technical decision. Nickelson landed hard kick after hard kick. After landing one of the hard kicks, Nickelson dropped his guard and Banks followed up with chingasos to get the KO. Gonzalez opens up the fight landing a flurry of punches but Santos stays composes and rushes in to a clinch. The rest of the round was highlighted by Gonzalez trying to land strikes while Santos looked for the clinch. In round two it was more of Santos relentlessly going in for a clinch and a takedown while Gonzalez fought to keep it standing while landing strikes. Santos starts off the round by rushing in, into the clinch, but this time her efforts pay off as she scores a head and arm judo throw. Gonzales quickly recovers though and again it becomes a battle of Santos trying to score a takedown, while Gonzales fights it off and lands sporadic punches. Results: Stephanie Gonzalez wins via unanimous decision. Ramirez got the takedown, and a scramble ensued. Reyes hit a suplex, but Steve Ramirez got back up immediately. Ramirez threw as soon as he got up and connected with Reyes' chin for the KO. Results: Steve Ramirez wins via KO. After a long feeling out process these fighter engaged in sporadic striking and clinching for most of the first round. Round two was started quickly with a fast and furious striking exchange. Mid round Gomez scores a takedown but Carson eventually makes his way back up. Carson lands an accidental knee to the groin and the fight is paused. After the break they get right back into aggressively trading chingasos! The third round once again starts with a flurry of striking from both fighters. About mid round the fighters clinch and aggressively fight to turn the fight in their favor with neither fighter being able to dominate. Results: In a fight in which the judges surely had a difficult time scoring, Keith Carson wins a majority decision and becomes the new Spar Star MMA Champion. This MMA event went so well that the Hollywood Park Casino awarded Tony Padilla and Spar Star Promotions a Saturday night opening June 20th to bring back MMA action. Stay tuned for details on that event.